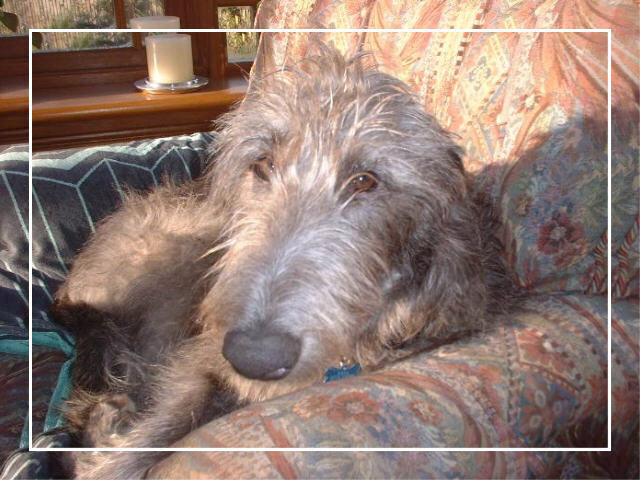 Xena our deerhound had a trauma on 11th June 2003 age three and a half. This was a very swift progressive paraplegia with urinary and faecal incontinence caused by a haemorrhage in her spinal area producing compression and degradation of her sciatic nerves effectively paralysing her rear quarters. Unfortunately the prognosys was not good, she would have been paraplegic with no possibility of recovery.. She lasted forty-eight hours. Our surgeon, Alex Lujan and staff at the Small Animal Hospital of the Faculty of Veterinary Medicine at Glasgow University worked very well on her behalf. Indications from an autopsy revealed that the findings within her spinal cord were consistent with a fibrocartilaginous embolism. In some way some cartilage-like material became lodged within the blood vessels of the spinal cord leading to the cessation of blood flow. 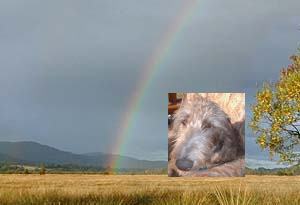 Due to the paralysis of her rear two thirds we therefore had to let Xena slip away to the Rainbow Bridge. The post-mortem indicated that she had also had hydrocephalis from puppy days. 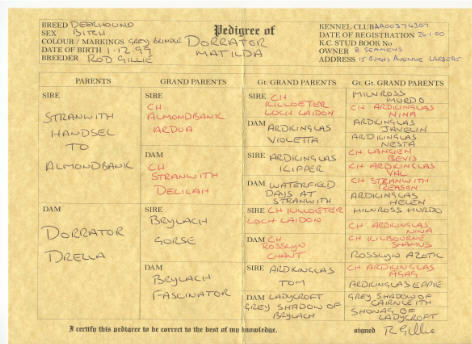 This perhaps goes someway to explain her extremely placid demeanour throughout her short life. 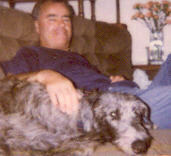 We have passed this information back to the Breeder, Rod Gillie, and The Deerhound Club. 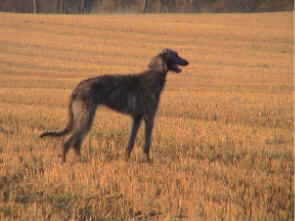 We now have a new deerhound called Tara. 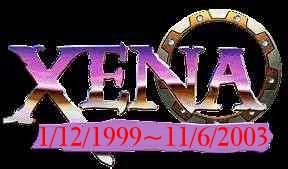 They will not go quietly, the dogs who have shared our lives. In subtle ways they let us know their spirit still survives. Old habits still make us think we hear them at the door. Or step back when we drop a tasty morsel on the floor. Our feet still go around the place the food dish used to be, And sometimes, coming home at night we miss them terribly. And although time may bring new friends and a new food dish to fill, That one place in our hearts belongs to them...and always will. Xena where is that rabbit? 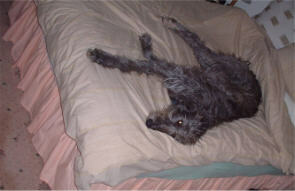 Xena doing what deerhounds do most. Xena on daddy's bed. Naughty girl.